No, it's not a miracle. Find out what is actually going on in this viral video. 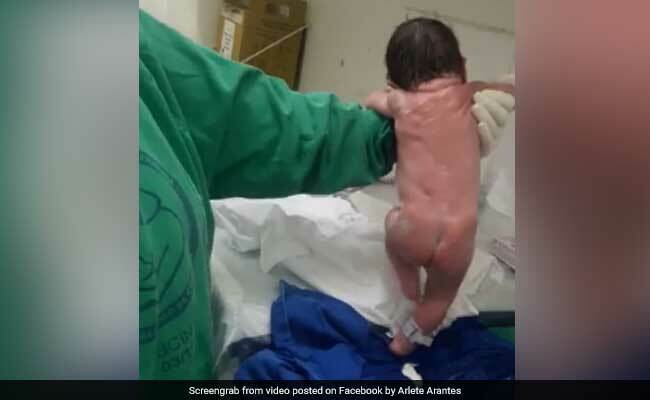 A video that appears to show a newborn baby "walking" moments after its birth is currently breaking the Internet. Since being posted on Facebook on May 26, the 41-second clip has been viewed well over 68 million times. It has been shared over 1.5 million times and has collected over 325,000 (mostly incredulous) reactions. The footage shows a newborn, being supported by a nurse, lifting one foot, and then the other, in movements that mimic walking. The video was posted on Facebook by Arlete Arantes from Brazil. It's unclear when the video was recorded. So, what's actually going on in the video? According to the University of Rochester Medical Center, the "walking" is not so much a miracle but a natural newborn reflex. Called the "stepping reflex," this reflex is also referred to as the walking or dance reflex because the baby appears to take steps or dance when held upright with his or her feet touching a solid surface. This reflex lasts until the baby is about two-months-old. It helps babies develop and survive. But that information hasn't deterred the Internet from doing what it does best: make jokes. "Gotta stretch the legs after a 9 month journey," writes one person on Reddit, where a GIF of the video has been posted. "That baby's name: Usain Bolt," jokes another. "That kid is going places," comments a third Redditor.